UPDATED — Norway bomber-shooter a Neo-Nazi, and NOT a typical bitter clinging Tea-Partying Hobbit. That’s 82 days per murder. 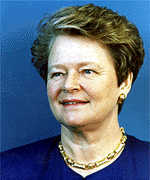 Norway’s former Prime Minister Gro Harlem Brundtland was his actual target. A timeline of mass shootings and also see how The Brady Bunch reacted, learn that Norway’s police are mostly unarmed and individually need to justify why they should be allowed to carry a weapon while on duty. Now it comes to light that the manifesto this p.o.s. put out is a total cut-and-paste thing. Bingo ! — The p.o.s got his marching orders from the lowest of the low, NOT Rush, Sean, Glenn, Michelle, Ann, etc. The ‘summer camp’ was a far-left political youth gathering. A man dressed as a policeman shot and injured at least five people at a meeting of the youth wing of the party of Prime Minister Jens Stoltenberg on Friday after a blast in the capital, Norwegian public broadcaster NRK said. Police confirmed that shots were fired at Utoeya, an island south of Oslo where Stoltenberg’s Labour party’s youth section’s yearly gathering was taking place. Police were on the way to the island. Update 1 ; 2:30pm Eastern 22 July. (Reuters) – President Barack Obama on Friday extended his “personal condolences” to the people of Norway following the blast and shootings in Oslo, and said he had no information yet on the motives. Hey genius, check your BlackBerry. By now, Soros or one of those Sheiks should have sent your instructions on what to say and do. Norway camp shooter identified — authorities say he was working alone and attacks were not Islamic terrorism. In other words…… Blame the Tea Party…… Blame Bush…… Blame typical bitter clingers…… Blame gun owners…… etc. Police said the man arrested in the shooting is Norwegian and had set off a bomb that killed seven people outside the prime minister’s headquarters in Oslo, about 20 miles (35 kilometers) from the camp. The Oslo Bomber is a Right Extremist. 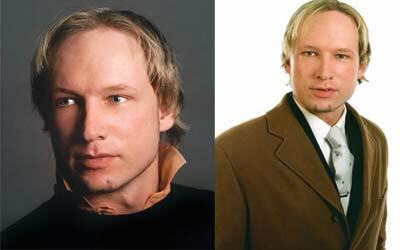 32-year-old Norwegian Anders Behring Breivik was arrested after the shooting in Utøya on Friday. Police believe he is linked to the bombings in the government quarter. He is said to be the member of a right extremist group in Norway. Norway police arrive 90 minutes after firing began. Oh goody…… Here come the conspiracy theories from the left that because this camp was a leftist thing, the police – who everyone knows are also completely right wing extremists – didn’t care, etc. Update 6…… 24 July 2011 — 6am Eastern. ……authorities have said Breivik held anti-Muslim views and posted on Christian fundamentalist websites. Lippestad said Breivik spent years writing the 1,500-page manifesto that police were examining. It was signed “Andrew Berwick”—an apparent anglicization of his name. Christian, white guy, gun owner, anti-this, anti-that…… He’s the total package of what the left keeps attempting to force-indoctrinate as reality regarding each and every patriot and freedom-loving person…… Almost as if they created him and the situation at hand. Get ready for what’s coming. The left around the world – especially here in America – are going to make this s.o.b. their poster child to force their agenda and eliminate individual and other rights. The media is going to go to great lengths to help things along too. The approaching smell test is already failing. I knew it instinctively, just like breathing…… They’re at it full-bore. (AP) – Anders Behring Breivik said he was a boy when his life’s path began to turn. It was during the first Gulf War, when a Muslim friend cheered at reports of missile attacks against American forces. “I was completely ignorant at the time and apolitical but his total lack of respect for my culture (and Western culture in general) actually sparked my interest and passion for it,” the suspect in Norway’s bombing and mass shooting wrote in his 1,500-page manifesto. ……and this guy should have been bagged, tagged and dragged the instant L.E. got him in their sights. Norway mass killer wants time in court to tell why. “He has been politically active and found out himself that he did not succeed with usual political tools and so resorted to violence,” Lippestad told TV2 news. “I await a medical assessment of him,” he said. That Breivik deliberately surrendered to police when finally confronted on the tiny island of Utoeya after cold bloodily gunning down 86 youngsters underlines his desire to grab a public platform to deliver his radical thoughts. There’s going to be ‘trouble’ stemming from this for all freedom and rights loving people. Update 8…… 25 July 2011…… 9:30am Eastern. The fact that Norway’s maximum penalty for any crime is 21 years in prison is facing rising criticism in the wake of the twin attacks that killed 93 people, with many deeming the penalty too lax. Ever since Norwegian media named 32-year-old Anders Behring Breivik as the prime suspect, calls have been growing for the maximum penalty under the Norwegian penal code to be extended. The man who bombed Norway’s capital and gunned down Labour Party youths on an island, killing at least 93, told police he intended to target former Prime Minister Gro Harlem Brundtland, Oslo newspaper Aftenposten said. “Anders Behring Breivik had plans to come to Utoeya (island) while Gro Harlem Brundtland was visiting on Friday, but claims under interrogation that he was delayed,” Aftenposten reported on Monday, citing unnamed sources. Note: Aftenposten is no longer available in English, or that article would have been linked here. Update 9…… 25 July 2011…… 11:00am Eastern. Timeline: Mass shooting incidents in last 20 years. Norwegian Anders Behring Breivik, the suspected right-wing Christian gunman who killed at least 93 people in an attack on a camp of Norway’s ruling Labor party and in a bomb in Oslo, was jeered on the way to a closed custody hearing Monday as he arrived at court. Here is a timeline of some of the worst shooting incidents carried out by one or two gunmen around the world in the last 20 years. I’m sure it’s a perfectly innocent mistake and/or sheer coincidence that Reuters left out mentioning the Democrat Left-Wing scumbag in Arizona who shot Congresswoman Giffords, a Federal Judge and other innocent people. The Brady Bunch crawls out of their hidey-hole. Hey Brady’s…… A question for each one of you as individuals…… Whatcha gonna do when some evil s.o.b. confronts you with some sort of a weapon (not necessarily a gun), demands your money/stuff, etc. and you cower like the sheep you are, give them whatever…….. and then the evil s.o.b. goes after you to commit violence anyway ? You can all go spit up a rope. Back off before you start something you could never ever finish. Update 11…… 3:45pm Eastern, 26 July 2011. Norway justice minister defends police over massacre. Norway’s justice minister has leapt to the defence of the police response to last week’s double terrorist attack, while more details emerged of how Anders Behring Breivik carried it out. Knut Storberget said police had been “fantastic” in the aftermath of Friday’s bomb and mass shooting, while promising an “open and critical” review of why it took armed officers more than an hour to reach the island of Utøya where Mr Breivik killed 68 people. Most L.E. in Norway are not armed and other than spec ops officers, HRT’s and the like, all must justify their request to become armed while on duty. By law, Norwegian police officers must have authorization from their chief to gain access to a firearm. The 1500+ page “manifesto” that is alleged to have been written by Norwegian mass murderer Anders Behring Breivik has the Left and their establishment media allies doing circle jerks and kept them busy for the past few days checking the “manifesto” for names from their enemies list. But it appears to be a complete cut-and-paste job rather than the culmination of years of extensive study by the killer as has been repeatedly claimed by the media (NY Times, Washington Post, CNN, etc.) and the killer himself (in the first few pages of the “manifesto”). Update 12, 1 August 2011, 7:00am Eastern. The killer was inspired by neo-Nazi groups, not Michelle Malkin or Glen Beck. Media Matters will be so disappointed. This entry was posted on Friday, July 22nd, 2011 at 12:18 and is filed under Main Postings. You can follow any responses to this entry through the RSS 2.0 feed. You can leave a response, or trackback from your own site. 7 Responses to UPDATED — Norway bomber-shooter a Neo-Nazi, and NOT a typical bitter clinging Tea-Partying Hobbit. The only surprise here so far is that this is in Norway, not UK or USA. I wonder if we’ll ever get the full story behind this guy. The media will portray him as a typical Conservative. Almost as if they created him themselves to generate a crisis too good to waste. Norway has no concealed carry law. This nutcase was able to walk around for an hour & a half shooting almost 90 people. 90 UNARMED people. If just one would have been carrying, this whole thing could have had a very different ending. Ninety minutes to first response. I’d hold the local PD and Norwegian Government responsible for that and demand answers and heads. How do you have an event that big, and absolutely NO security. Even one person in case someone gets hurt or there is a scuffle? Norway is heavily invested in the mentality of “it can’t happen here”.